Steve Kiel wants to create a “play revolution” in his home country of Bulgaria. In his Ted Talk about this, he gives a convincing and scientific argument on how play is vitally important to everyone, and how it makes us healthier and more productive. 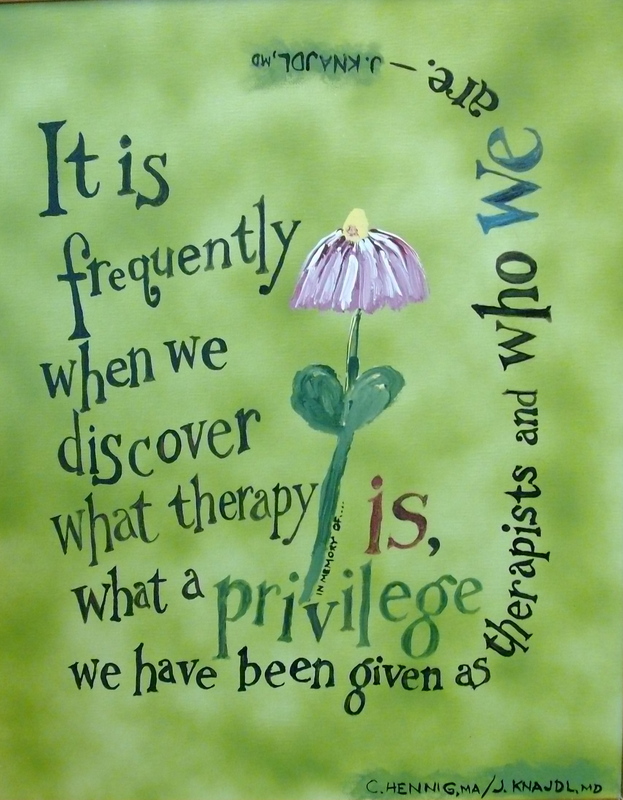 Yes, this is why art therapy works! This is an especially good project for people who have survived abuse or trauma. It’s a way for you to make contact with and solidify for yourself the concept of safety. Start by finding a box or other container. It can be any size or shape you want. You can get a box out of the trash, reuse a product container, or go out and buy a special box at a craft or gift store. 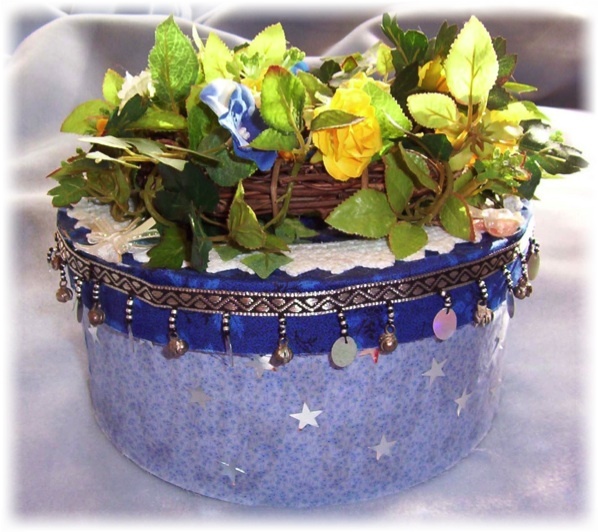 Next, collect some materials to decorate and embellish your box. You are creating a safe place for yourself inside the box, so think about what that means to you. What colors are your favorites? What kinds of textures to you find soothing? Do you have any symbols that represent safety, security, or trust? Craft stores have lots of great things for this project. Check the scrapbooking section for 3-D stickers and embellishments, the dollhouse section for miniature objects, the floral section for silk flowers and fancy stones, the jewelry section for jewels and charms, and the school projects section for miniature animals and plants. Now get to work transforming your box into your own personal safe place. 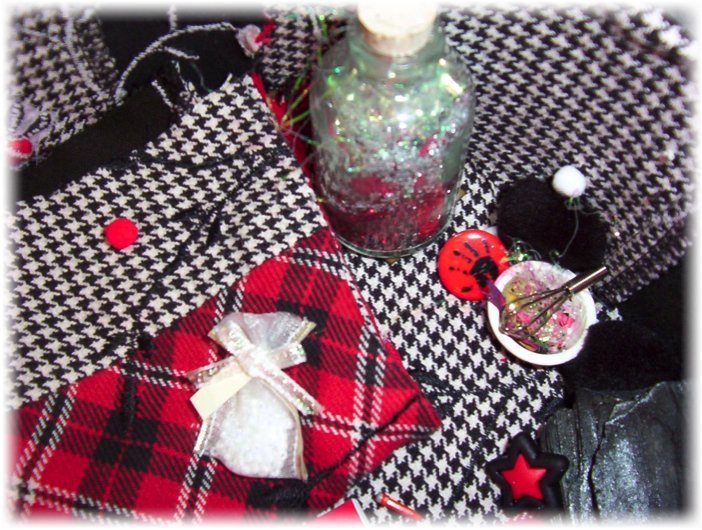 You can use paint, decoupage, or tissue paper collage, or any other method to cover the outside of the box. 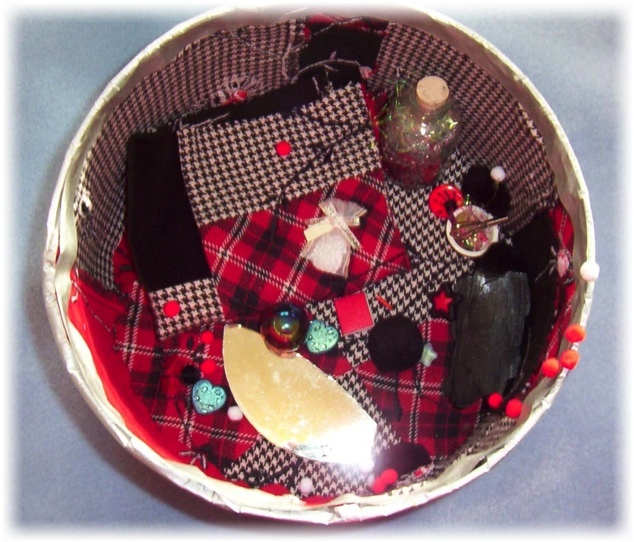 Then decorate the outside however you like with drawing, painting, cut-out pictures, stickers, glitter, glued on objects, or anything else you like. Then repeat this process on the inside, making a scene that feels safe for you. Allow yourself to have fun with this project and to invest emotionally in it. Find a good place in your home to display it. You can continue to add things to it or change it at any time in the future. You can add special symbolic objects or gifts to it. When you’re feeling stressed or anxious, it’s something you can get out and enjoy and feel soothed by. I’ve done this project with many abuse survivors over the years and they all love it. Many have told me years later that they still have their safe places and have been adding things to them and changing them over the years. A nursing home volunteer discovered that music has the power to “wake up” people with dementia, bringing back old memories for them and making them more responsive to their environments. This wonderful film documents this process, as well as his process of trying to get iPods with personal playlists on them into the hands of every dementia patient in the country. This is another great example of the healing power of the arts. It also has delightful footage of elders encountering music; footage that reminds me of my work with elders and art-making. I’m going to be posting some simple art projects you can do to help relieve stress and anxiety. Mandalas are circular designs that are created for spiritual purposes in a number of eastern religions. In art therapy, a mandala is any circular design. Mandalas are used in art therapy as a centering and calming exercise. The instructions are very simple. Find something round, such as a dinner plate, to use to trace a circle on a piece of paper. Now that you have your circle, fill it in however you like. You can use any kind of drawing media, such as markers, pastels, or colored pencils, or you can use paint, or you can combine any of the above. Many of my clients have found the process of filling in the circle to be quite calming and soothing. In the fall of 2007, I began working on my clinical hours to become a licensed mental health practitioner and a registered art therapist. My first clinical supervisor was Jeffrey Knadjl, MD, a psychiatrist who specialized in psycho-oncology, or the mental health needs of cancer patients. He and his nurse practitioner, Barbara Clinknenbeard, really believed in the power of art therapy for helping their patients. I began doing art therapy and counseling with their patients at Creighton University Medical Center. Dr. Knajdl was an extremely intelligent and compassionate mentor for me. What I loved about him was that he really understood the power of art and could see in my clients’ artwork the same things that I saw. He and Barbara really respected me, and they invited me to wear a lab coat–the biggest symbol of professionalism in a hospital– while doing art therapy with their patients. They told me I could decorate it, since it was an art therapist’s lab coat. I didn’t do that right away, though, because I wanted to just experience what it felt like to wear the coat unadorned. In July of 2008, I was stunned when Barbara called me and told me that Dr. Knadjl had died in his sleep, from complications of rheumatoid arthritis and sleep apnea. Immediately, my grief process began. It started with disbelief–I kept thinking I would eventually hear that it was all a horrible mistake or a misunderstanding, and that he would still be alive. When I saw his obituary in the paper, it hit me like a ton of bricks that he was really gone. I then decided: NOW is the time to decorate my lab coat! I created a memorial pocket, using a photograph of Dr. Knadjl that I printed on ink jet fabric and glued to one of the lab coat’s pockets. 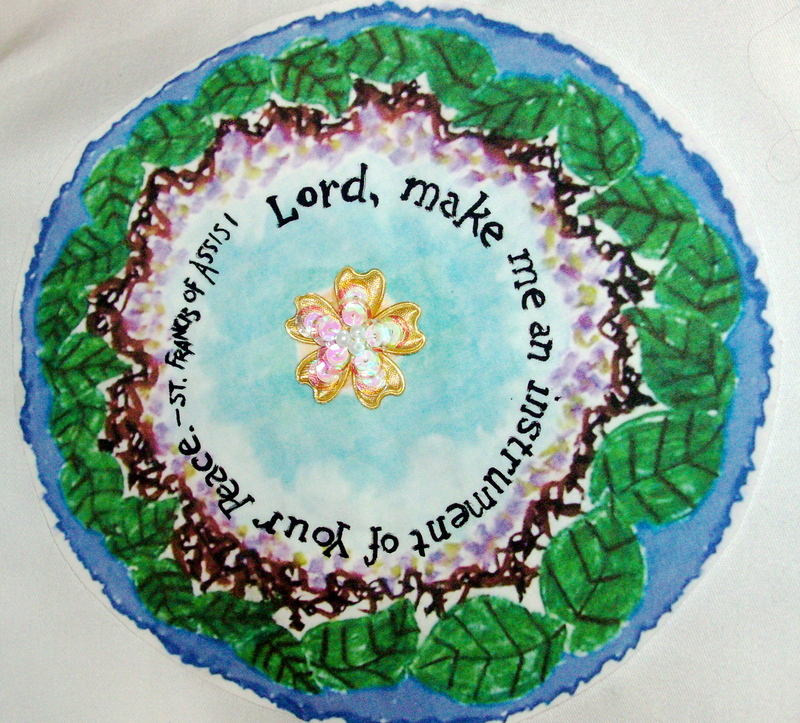 I had found out that Dr. Knajdl’s favorite prayer was the Peace Prayer, so I made a mandala on the back of the lab coat with a line from the prayer on it. 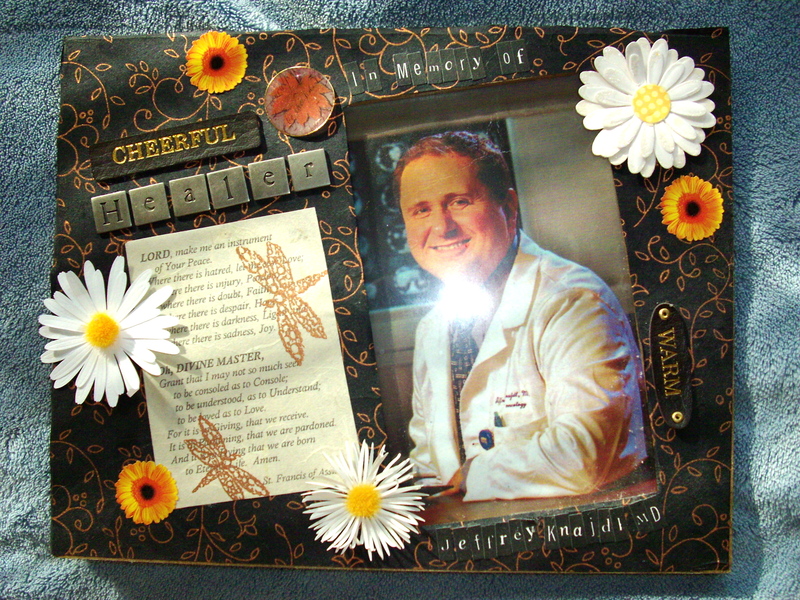 I also made several memorial frames in honor of Dr. Knadjl. You can buy unfinished wooden frames at craft stores, such as Michael’s. These frames are easily decorated with paint, paper, and scrapbooking embellishments, and then you can put a picture of your loved one in the frame. 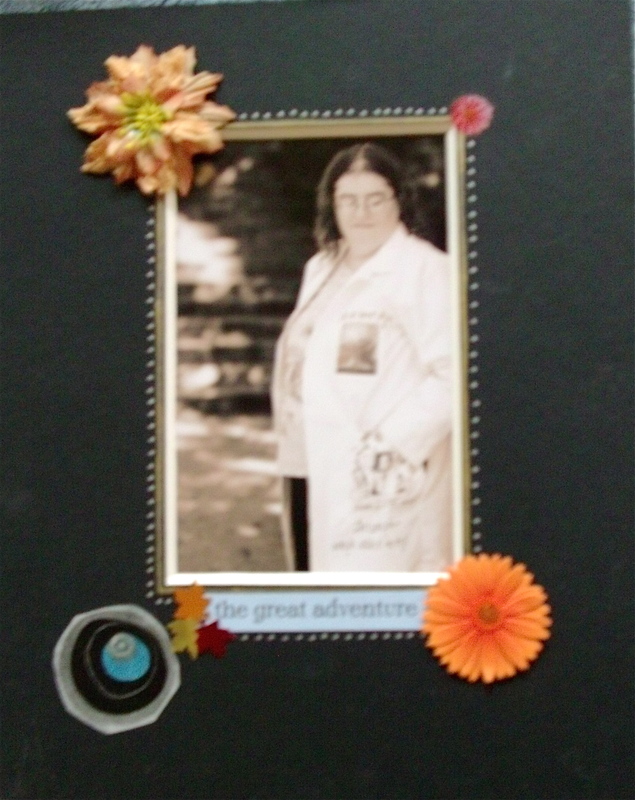 The first memorial frame I made in honor of Dr. K. I gave to Barbara. The second one was for me. It sits on my desk at home, and it comforts me when I look at it. I didn’t find out until after he had died that Dr. Knajdl was an artist himself–he enjoyed painting very much. Barbara donated his art supplies to me for art therapy. 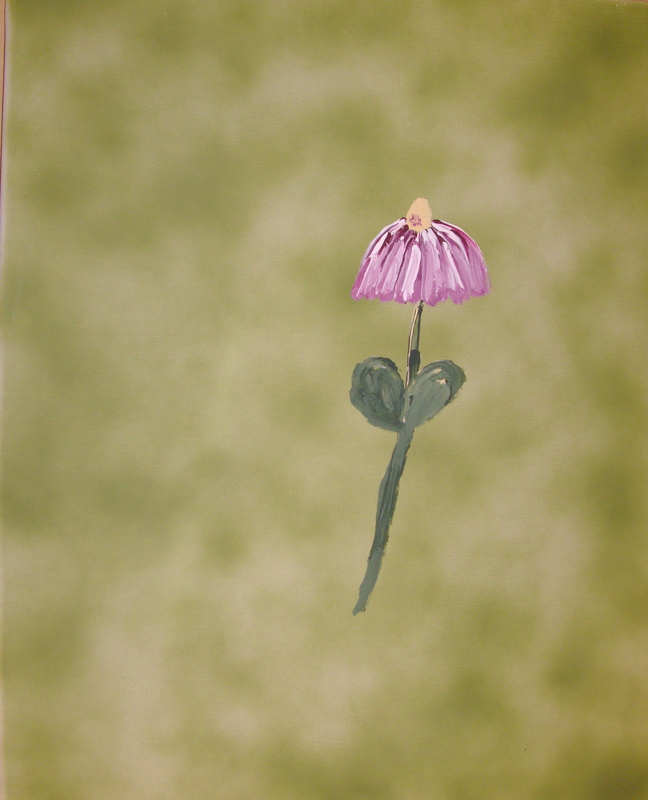 Among his blank canvases, I found a delightful unfinished painting of a flower. 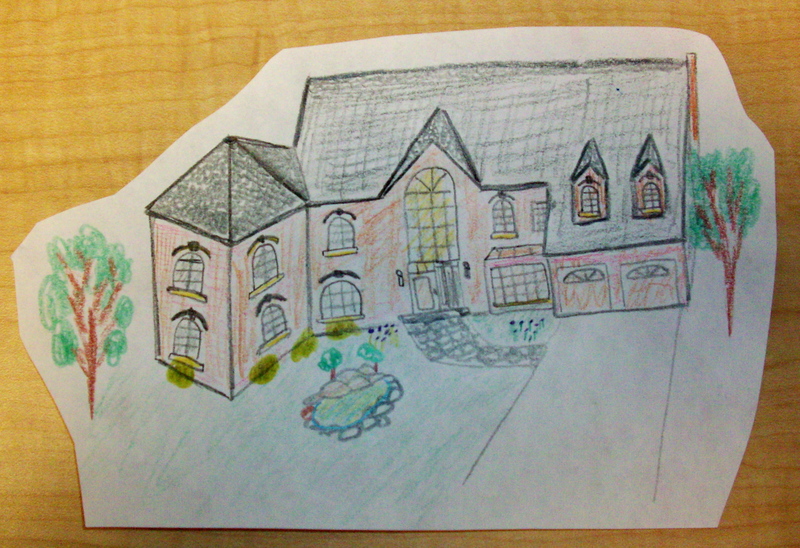 I also found in a sketchbook a wonderful little sketch of a house that he had done. I decided this house needed to be placed in an environment, so I cut it out and put it on another piece of paper and created a safe place for it. If you’re in a grief process right now, you might be wondering what the point of all this art making was–after all, it couldn’t bring him back. The point is that art-making gave me something to DO with my grief. The worst thing about experiencing the death of a loved one, I think, is that it makes you feel so helpless. Expressing my feelings through a tangible process of making lessened that feeling of helplessness, while simultaneously validating my feelings and honoring the relationship I had with Dr. Knajdl. Every time I made another art piece about my grief, I felt more settled, and more able to carry on. Find a box and paint and decorate it. You can find nice unfinished wood boxes at craft stores, or you can recycle a box you find around the house. Place special items that remind you of your loved one inside the box. Find a nice stone and draw or write a message on it with a Sharpie pen. Or you can use letter stickers from the craft store to spell out a message. Add tiny stickers, stick-on jewels, and other embellishments to the stone. The important thing is to DO something with your grief by making something tangible to express your feelings, validate your loss, and honor your loved one. You’ll feel better for it. This TED talk features a woman with severe schizophrenia, who, with excellent treatment and support, has become a law professor. She is working to change how people with mental illnesses are viewed and treated by society. She is living proof that people with psychiatric disorders can nevertheless become high functioning with the right kind of help, plus their own motivation. I just saw the film Defiant Requiem on Netflix. It is a documentary about how the prisoners of the Nazi concentration camp Terezin continued to create art, music, dance, and theater despite the horrorific abuse they were suffering, and how this creative activity preserved their humanity. Survivors tell how when they were singing, they no longer were prisoners, at least for that moment. This is why art is important! This is why I will always be an artist and why I am dedicated to bringing the power of the art process to all people who are hurting. I’ve started a Pinterest board on interesting creative ideas I’d like to try. Take a look! This page is a work in progress. 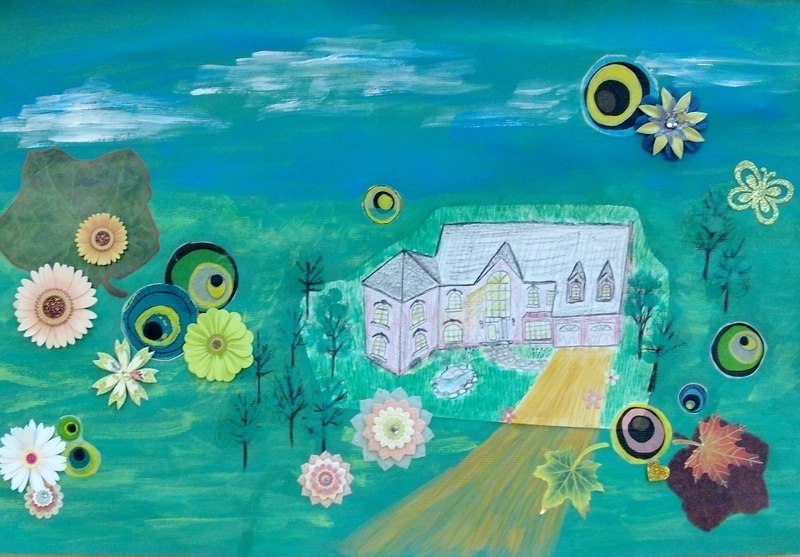 Click on the links above to find out about art therapy and what I do. Click on “Contact Me” to find out how to get in touch with me. There will be more to come!